If you’re looking for things to do in Karlovy Vary, also known as Carlsbad, search no further. 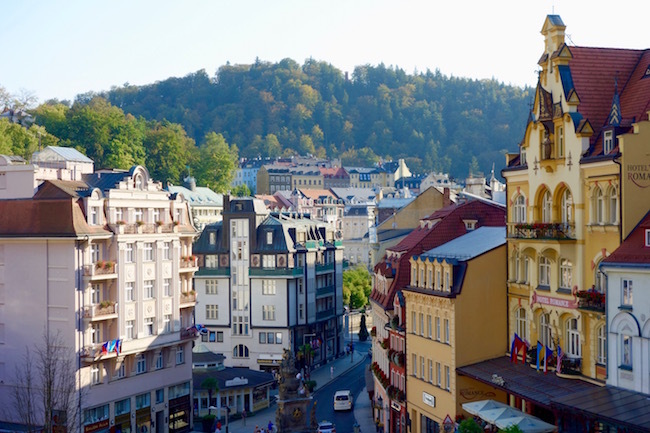 An elegant spa town in the Bohemia region of the Czech Republic, Karlovy Vary has a rich history, steaming mineral springs, woodsy walking trails and plenty of upscale shops, cafes and spas. 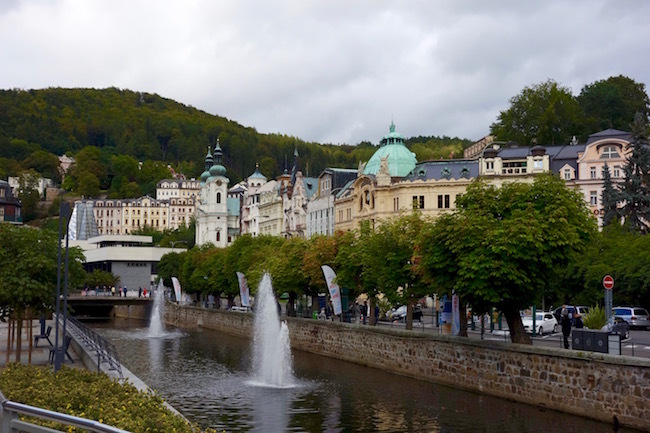 Spending one day in Karlovy Vary is a great addition to any trip to the Czech Republic – but it’s even better for a longer stay. This travel guide will help you plan your trip. I can’t get enough of Czech spa towns, and Karlovy Vary (Carlsbad) is one of the biggest, most glamorous spa towns in Europe by far. 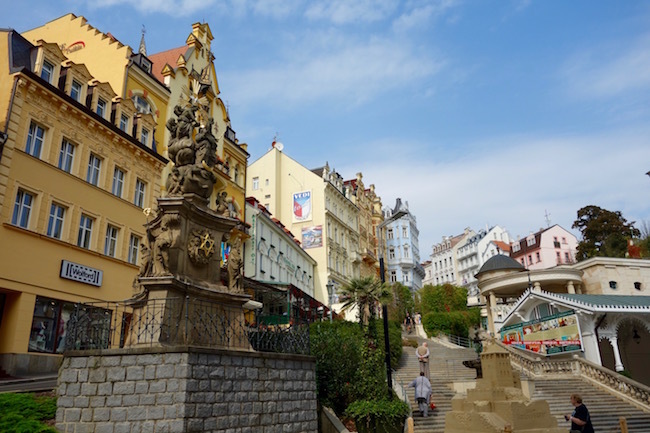 Making it extra handy, if you’re spending just one day in Karlovy Vary, you can pretty much sightsee in a line from one end of the pedestrian spa promenade to the other. 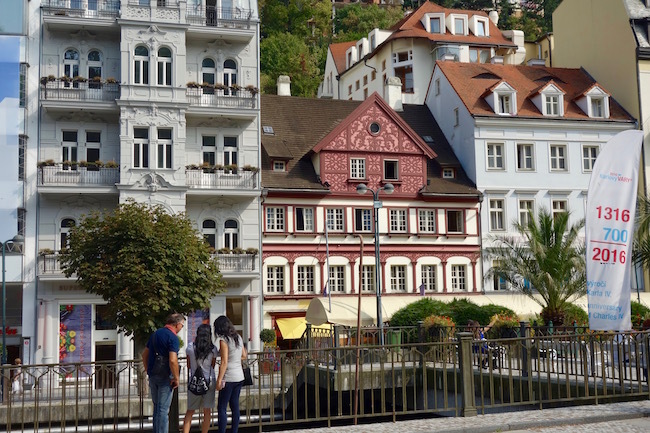 For much of that time you’ll be blinking in astonishment at the pastel-coloured villas and hotels that rise up through the Tepla River valley like a dreamy pale rainbow – the rest of the time you’ll want to follow this Things to do in Karlovy Vary guide. 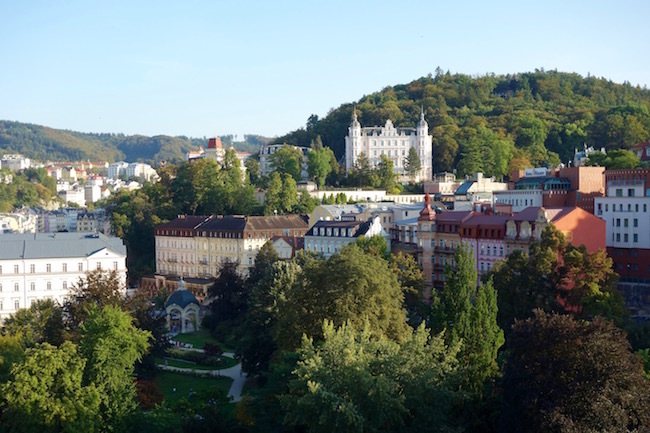 Founded in the Middle Ages by Charles IV, King of Bohemia and Holy Roman Emperor, Karlovy Vary’s claim to fame is its mineral-rich thermal water that gushes up from some 79 different springs, 13 of which are used for drinking cures. In the 18th and 19th centuries the town was the spa destination of choice for many of the European rich and aristocratic, hosting A-list visitors such as Beethoven, Tolstoy, Mozart, Kafka and Peter the Great. 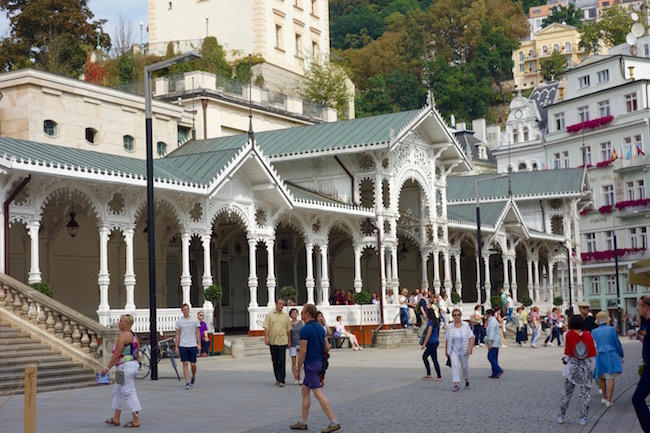 While North Americans love to scoff at the healing power of hot springs, the European mindset is different, and the springs of Karlovy Vary have been used for centuries to treat various health disorders such as digestive issues, gout, diabetes and arthritis. The ‘spa cure’ includes both drinking the water and having spa treatments with it, like thermal water baths, mud packs and even gum irrigation. In fact, the springs in Karlovy Vary and other Czech spa towns are considered so healing the Czech government regularly subsidizes spa stays for its citizens. And can I just say, for the amount of time I spend at Czech spas – and the fervour of my devotion to them – I should be granted honorary citizen status at once. 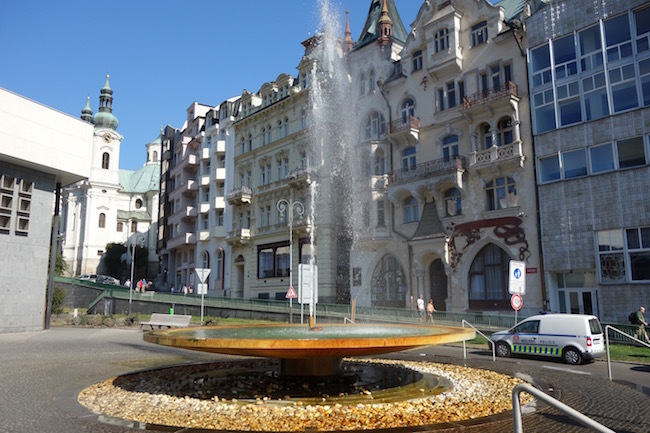 The second thing to do in Karlovy Vary (we’ll get to the first in a minute) is to walk around and drink it all in – both the water and the lavish Art Nouveau and Baroque architecture, with a sprinkling of Communist concrete to mix it up. Fancy porcelain cups with built-in drinking spouts are the traditional way to sip spring water in Czech spa towns. You can pick up a cup from any souvenir shop or kiosk on the street. Go all out and get a gold-rimmed designer cup you’ll treasure forever, or get the cheapest one you can find. Why buy a spa cup? Because sampling the mineral water is the main activity in Karlovy Vary and you want to get with the program, and because some of the thermal springs are so hot a plastic water bottle is in danger of 1) melting and 2) releasing all those BPA toxins into your healing water, which kind of defeats the purpose of drinking it in the first place. For this self-guided (or ahem, this Wandering Carol guided) walk we’ll start at the north end (the bottom) of the spa zone and work our way up (which is south). And yes, north would logically mean up, but it doesn’t work that way in Karlovy Vary, but somehow makes sense when you’re there. 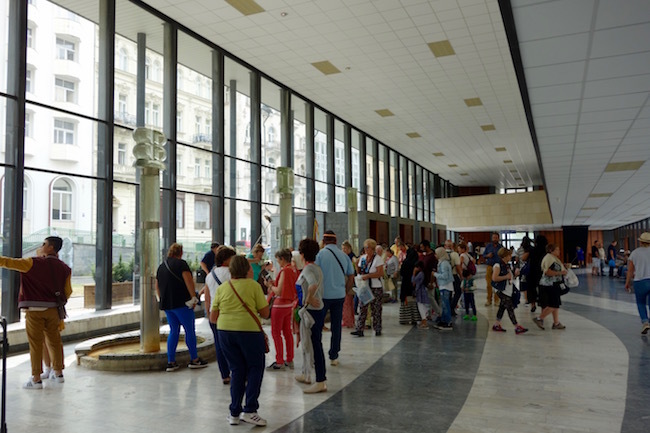 If you’re coming from the bus station cross the busy street and look or ask for directions to the pedestrian street of Masaryka, a diagonal street that will lead you up to the spa centre. Opposite the Spa Hotel Thermal you’ll find Dvořák Park, named for the composer Antonín Dvořák. It’s a lovely stretch of green with weeping trees and a scenic pond, a good place to loll around, relax or hunt up the statue of Dvořák himself. Next you come to the Park Colonnade, an ornate bit of Viennese ironwork from the 19th century. 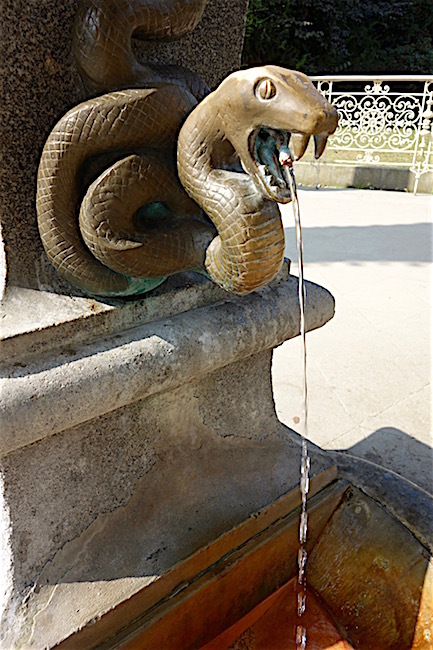 The pavilion that once surrounded it is long gone, but if you wander down to the end, you can sample your first taste of spa water at the Snake Spring, which pours out of a sculpted snake spout at a temperature of 30C (86F). I’ve heard it’s named for the grass snakes that used to hang around the colonnade. 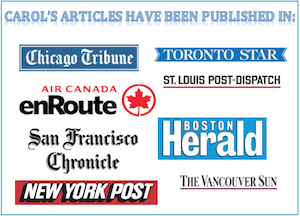 Wait – did I say snakes? Don’t worry, I’ve been assured they’re not there anymore. A note about the spa water of Karlovy Vary: The mineral makeup of each spring is very similar, but the temperatures vary greatly, which means that there are different levels of dissolved salts and minerals in each spring. Interestingly, the Neo-Renaissance Mill Colonnade wasn’t popular when it was built in the late 1880s. Maybe it was too stately for the spa-goers’ taste, but now it’s one of the main landmarks in town, although with all those fountains, it’s not so much a landmark as a water mark if you think about it. It’s at this point usually, that I start to feel like I’m drowning from the inside, so I hope you’ll be more sensible and restrained about drinking thermal water than I am. You may also be pleased to know there are public toilets at one end of the Mill Colonnade – bring change because there is a small fee. While you’re there (at the Mill Colonnade, not the toilets) glance across the river and you’ll see the Peter House, a half-timbered building and one of the older buildings in town. Built between 1706 and 1709, it’s now a pizza restaurant. A plaque outside is dedicated to Peter the Great, who, in a typical show of manly prowess, helped build a house across the road. Stop scratching your head and get out of my shot! By now you may be getting tired of viewing fountains and colonnades but there are two more you should see. 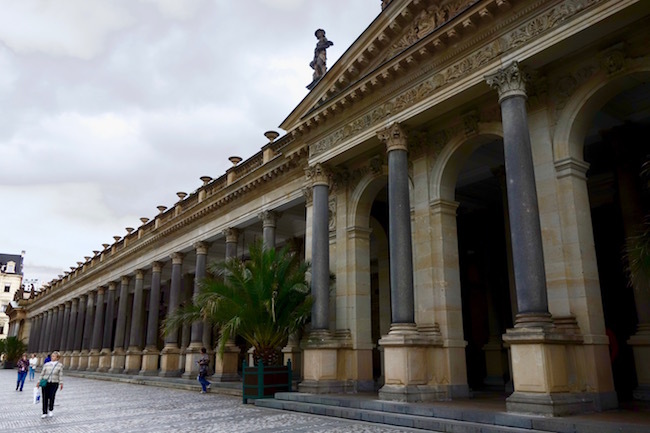 One is the frothy-looking Market Colonnade. Inside is the Charles IV Spring, said to be the original spring the king soothed his ailing legs in back in the 14th century when it was nothing more than a steaming pool in the forest. The white wooden building is so darn pretty it’s impossible not to photograph. You might, however, get the urge to start elbowing other selfie-happy tourists out of the way because they keep wandering into your shot. Calm down. Have a drink of water. Relax. If the crowds are really getting to you, backtrack towards the Snake Spring and stop at the booth shaped like a big green bottle. Buy a shot of Becherovka, an herbal liqueur produced in Karlovy Vary that acts as a digestive aid and is as much a part of the ‘Karlovy Vary drinking cure’ as spring water. Across from the Market Colonnade is the stern-looking Hot Spring Colonnade. Before you head in, take a look at the Baroque Church of St Mary Magdalene built in 1737. If it’s open you can peek inside to see the ornate altar and a Gothic statue of Mary. Travel tip: A little off the tourist trail, in the slightly-faded but very gracious district of Westend is another stunning church worth seeing, the Orthodox Church of Saint Peter and Paul. At the Hot Spring Colonnade you can get a sense of the Czech Republic’s Communist past through its geometric concrete-loving architecture. Inside, there are a number of fountains to drink from but the one you’re here to see is the Hot Spring Geyser. A burst of thermal water that can leap up to 12 metres high, it’s Karlovy Vary’s answer to Yellowstone’s Old Faithful, and the hottest spring in Karlovy Vary at a mind-boiling 72 °C (162 F). Yikes! Now that you’ve done your tour of the fountains and colonnades, continue up the spa zone. You have several options open to you at this point, all of them fun. Have coffee at the Café Elefant at Stará Louka 30. Chandeliers, white columns and gold mouldings … if it was good enough for Beethoven it’s good enough for you. Wander through boutiques selling high-end European clothing brands like Bogner and Marccain or stores showcasing pink porcelain and Bohemian crystal. Eat spa wafers. In all honesty, I don’t find them that delicious, but in Karlovy Vary, they’re a tradition. My favourites are the hazelnut and it seems like a ritual to buy them at U Jachyma at 34 Stará Louka just before you come to the Grandhotel Pupp. At the end of the spa zone is the legendary Grandhotel Pupp. This lavish 5-star property was the model for the hotel in the movie the Grand Budapest Hotel. It’s also featured in the James Bond flick Casino Royale and the comedy Last Holiday starring Queen Latifah. 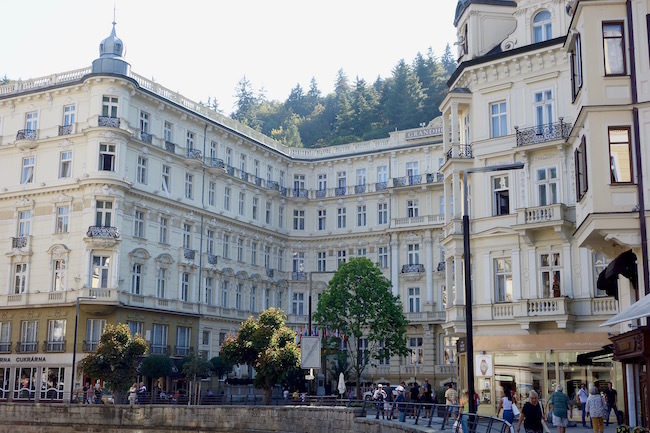 With a history that dates back to the 1700s, the Grandhotel Pupp is the most luxe hotel in Karlovy Vary, and yes, the correct pronunciation sounds a bit like ‘poop.’ Just let it go. You may think your tour is over, but the best is yet to come. If you walk to the right of the Grandhotel Pupp you’ll find a funicular to take you up to the Diana Lookout Tower in the wonderful Slavkov Forest. At the top you can climb the 150 steps (or take the elevator) up the watchtower for some spectacular views. If you like hiking you can walk up to the Diana Watchtower from town. There are so many trails and interesting things to see in the hills around Karlovy Vary, I can’t begin to describe them. Oh, wait. I already did. 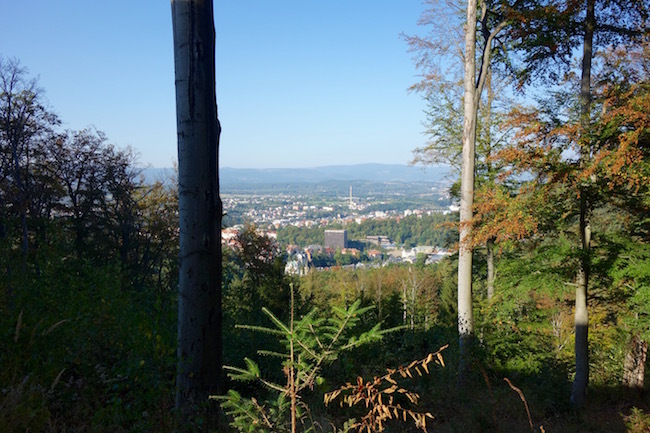 Visit my Karlovy Vary Deer Leaping Walk article to read more about that adventure. So that’s it for the walking portion of this ‘things to do in Karlovy Vary’ travel guide. If you’re spending more than one day in Karlovy Vary, however, or still have energy to spare, there are plenty of other attractions to see. One of the most popular things to do in Karlovy Vary is to visit the Jan Becher Museum. Why? Because finally you can drink something stronger than water. Remember the drink Becherovka we were talking about earlier? (Actually, you weren’t saying much at all. I was the one doing all the talking.) 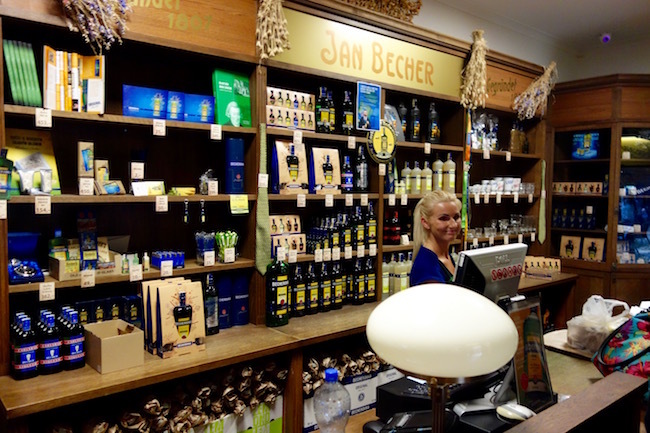 The Jan Becher Museum is dedicated to this legendary herbal elixir. The Jan Becher Museum is located at T.G.Masaryka 57 – which is essentially back where we started from. Visit the website for more info. If buying a porcelain cup with a spout isn’t enough of a breakable souvenir for you, tour the Moser Glass Factory. 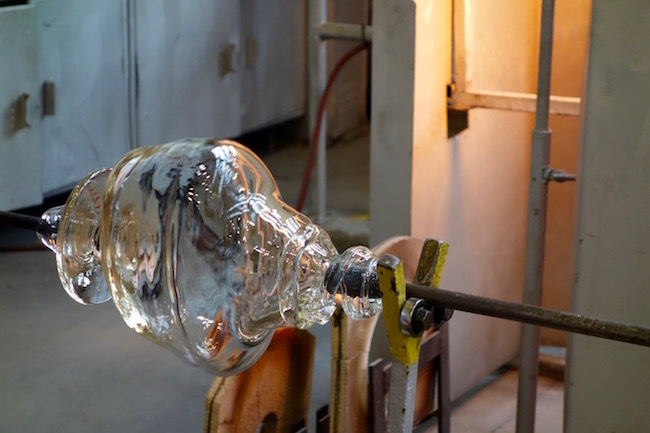 It was back in the 1800s that Ludwig Moser opened a glass workshop in Karlovy Vary, and his celebrated Bohemian crystal soon became the toast of the Austrian Hungarian monarchy. Check the Moser Glass website for tour times and prices. It’s located at Kapitana Jarose 46/19. You can take Bus No. 1, 2 or 22 from the bus stop Tržnice (Market hall) in the city centre. As a spa fanatic, I think delving into the traditional world of Czech spas is one of the absolute best things to do in Karlovy Vary. It’s not for everyone though, as treatments are much more clinical than in North America, and the naked body isn’t always carefully hidden from the therapist’s view. 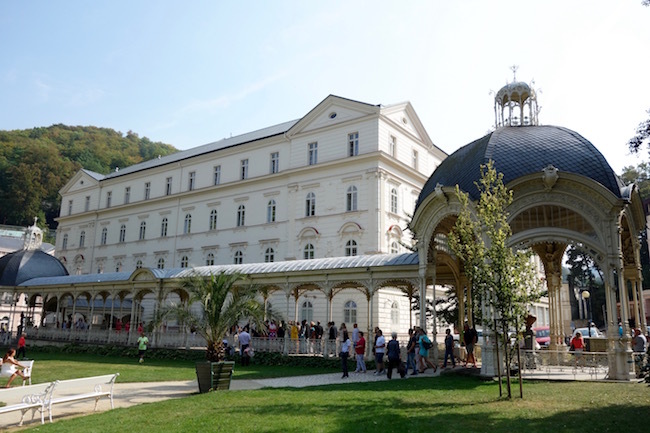 Where to spa in Karlovy Vary: If you’re staying at a hotel, it will likely have an onsite spa where you can sample a thermal water bath or get a massage. If not, you have a few other options. Spa tip: In the Czech Republic it’s not traditional to bathe in public hot springs pools, but rather to book a private bath at one of the spas. The Castle Spa. That said, the Castle Spa has a thermal water pool. If you want more of a North American spa experience, this is probably your best bet, but you’ll pay for the pleasure. The sign outside says Zámecký Lazne, which is a bit confusing. It’s across from the Hot Springs Colonnade and up some steps at Zámecký Vrch 360 01. The Windsor Hotel. If you just want to soak in the thermal water, the Windsor Hotel is friendly, right in the centre of the spa zone and offers affordable thermal water treatments. You can book a thermal water bath or take a dip in the very small and clinical-looking pool. Spa Hotel Thermal. You may read (in every single guidebook on the Czech Republic) that you can swim at the Spa Hotel Thermal in their large outdoor pool overlooking the spa zone, but it’s closed. Permanently. You can pay a day rate to visit the hotel’s indoor pool and sauna facilities, but the pools are regular water, not thermal. Elizabeth V Day Spa. One place I like for its traditional curative spa atmosphere – though again, it might too clinical for some – is the Elizabeth V Spa. Located at the beginning of the spa zone, even before the Spa Hotel Thermal, this white Neo-Baroque building at the foot of flowery Smetana Park offers treatments such as thermal water baths, massages and inhalations of thermal water (good for respiratory issues). They also have a pool, but it’s regular water not mineral springs. If you want the thermal water, opt for a bath. 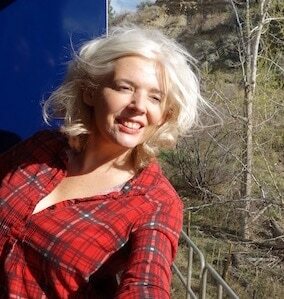 By train: There are two train stations in town. If you’re taking the train to Karlovy Vary from Prague, and you probably won’t be as it’s a 3.5 hour journey, you’ll end up at the Horní Nádraží Station. From there you can take a bus or a taxi to the spa zone. If you’re taking the train to Karlovy Vary from Marianske Lazne, or if you’re taking the bus from Prague, you should arrive at the Dolní Nádraží Station. In this case, cross Zapadni Street and look or ask for directions to the pedestrian street of Masaryka, a diagonal street that will take you towards the spa centre. If you’re travelling from Prague to Karlovy Vary by car or bus it takes about 2 hours. 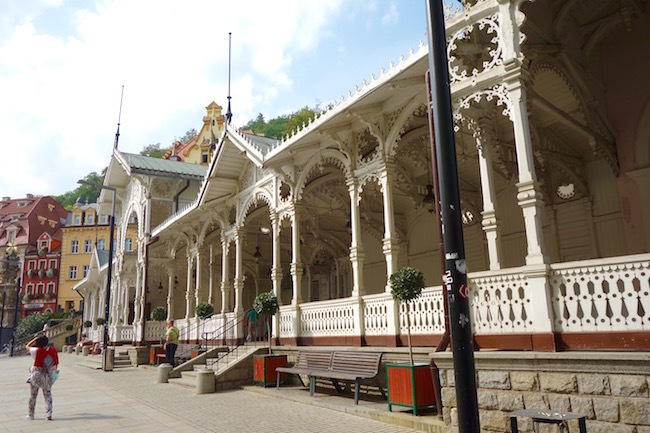 Tourist Information: There are two tourist information centres in Karlovy Vary. One is at T.G. Masaryka 53, not far from the bus station. The other is in the centre of the spa zone at Lázeňská 14. There are many hotels in Karlovy Vary and something for every budget. At the top end of the spectrum is the Grandhotel Pupp. I’ve also heard good things about the Quisisana Palace, a Neo-Baroque building that dates back to the 19th century. If you want a true traditional Czech spa experience, people have recommended the Dvořák Spa Hotel. 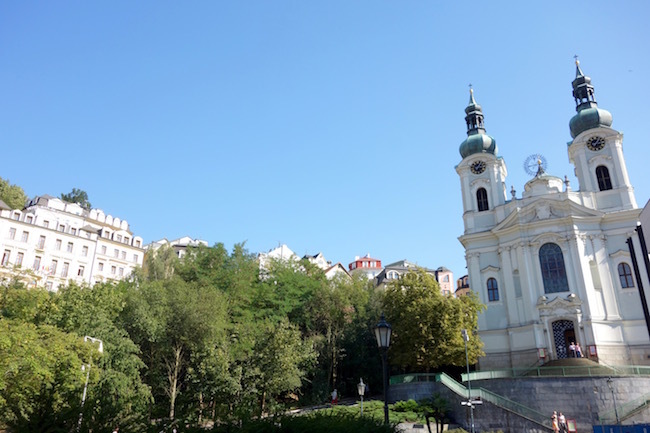 The three hotels I’ve stayed at are the Spa Hotel Thermal, the Grandhotel Pupp and the Hotel Imperial – I talk more about them in this Karlovy Vary hotel article. Loket If you’re looking for places to see outside Karlovy Vary, think about visiting the historical town of Loket, less than a half an hour away. Marianske Lazne (Marienbad) is probably the spa town closest to my heart. 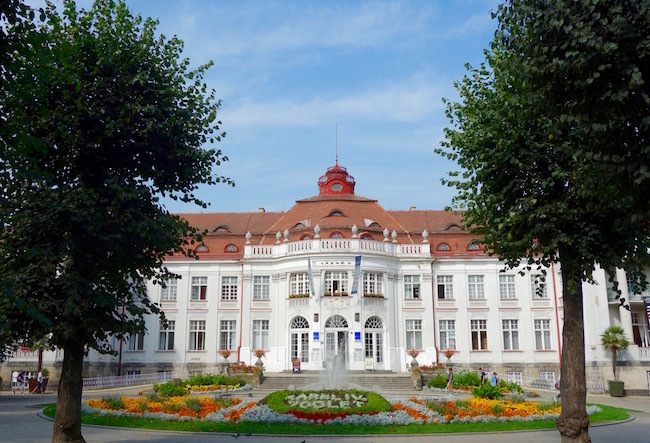 Check out this Spa in Marianske Lazne blog post to learn more about it. Resources: The Czech Tourism Board has an excellent website on travel in the Czech Republic. That wraps up our sightseeing tour. Congratulations if you’ve stayed with me to the end. 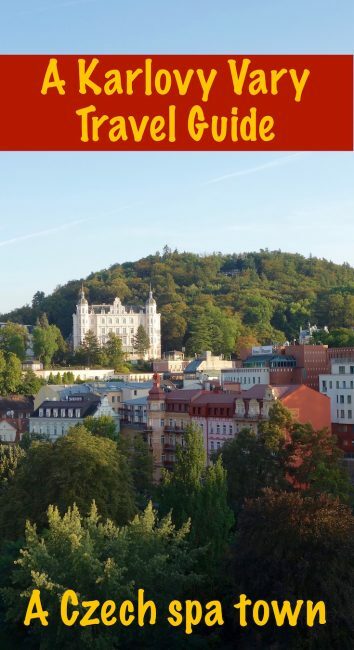 Hopefully this comprehensive travel guide will help you plan your stay, whether you’re spending one day in Karlovy Vary, a weekend, or settling in for a longer stay. For more info on Europe read Top Destinations in Europe or visit my Europe Travel category page. Disclosure: My trip was subsidized by the Czech Tourism Board. All opinions and undying devotion for European spa towns are my own. Have a great trip to Karlovy Vary, Deb. Let us know how it goes. Thank you for such an informative article. I am looking even more forward to my stay in Karlovy Vary in a couple weeks from now ! So lovely town. Miss it. What a handy guide. I have only been to Prague. This spa town is definitely on my list when I return. 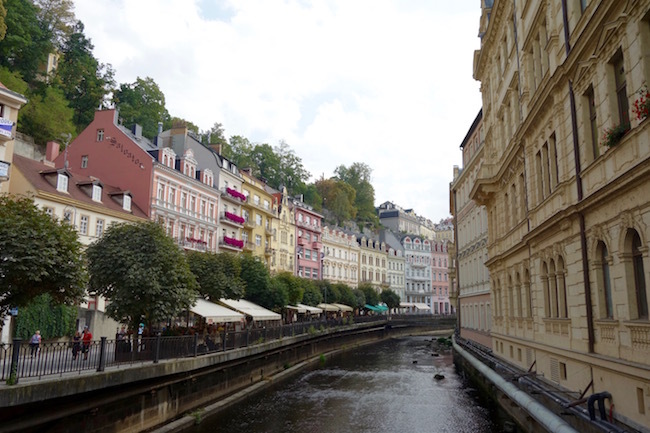 I would love to get to Karlovy Vary at some stage – I’ve been reading through many of your spa posts recently!! I’ve been fortunate enough to visit a large portion of the Czech Republic and fall in love with the country even more each time I go back. Thanks, Mansoureh. 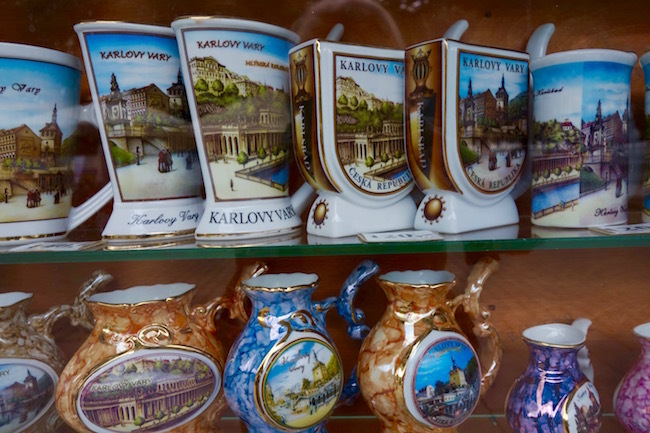 Yes, Karlovy Vary would be ideal for a weekend break. I love a good hot spring! Who would scoff at that?! Hi Veronika, I love the Czech Republic. Yes, so many other countries use hot springs as big public pools to soak in. I’m not sure why the tradition is different in the Czech Republic – but at least your country takes spas seriously so they’re far ahead on that score. Any city that is obsessed with spas I am totally there for! Looks like a great place. I still have so many places to see! I missed out on visiting Karlovy when I was in the Czech Republic, but I’m sure I would have loved the town! It sounds like such a great place to relax.The mix of walking trails, beautiful architecture and thermal springs sound like the perfect combination! This post is so comprehensive. You’ve really done this town justice. I didn’t know it existed before now, and I’m shocked to hear how many thermal springs they have. I can imagine they’re capitalizing on it! It looks like a fun place to walk around and enjoy. Karlovy Vary looks like a marvelous spa town. I love the idea of of sampling all the different waters and enjoying spa treatments. Thanks for all the information! I love your new term (sipp seeing!) and isn’t the Grand Hotel Pupp fabulous! I want to live there! I must have just missed you, Danik. Too bad! 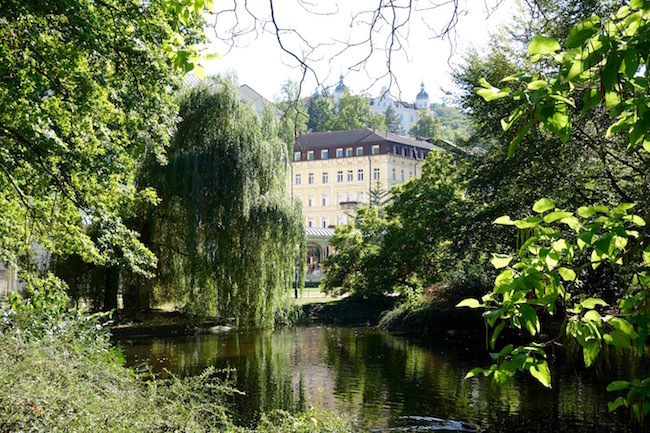 From the spa wafers to thermal waters, I’d love to spend a week or more at Karlovy Vary.